Comments: This figure, and it’s two companion figures were based on the 2008 LucasArt’s multi-console game – ‘The Force Unleashed’ which takes placed in the years between “Revenge of the Sith” and “A New Hope”. You play the game as Galen Marek, a secret apprentice to Lord Vader. Hence the name of this Evolutions set. Galen Marek is a must-have for fans of ‘The Force Unleashed’. Here he is in his default costume for the course of the game. 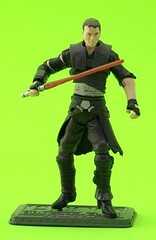 The other figures in the Evolutions pack are representative of his Sith and Jedi personas; but here he is conflicted – his destiny still being shaped. And ultimately it is the game that makes this figure something more than just another Star Wars figure with a lightsaber. If you haven’t played the game, you likely don’t give two shakes about good ole’ Galen.